Pay 1000 LP. Negate the effect of all face-up monsters on the field. Wow...it's been a while since I looked at this thing. I tried a deck utilizing this card in the past -- the deck flopped miserably. However, that's not to say that the card doesn't hav eother uses. *Your deck runs several monsters that "get around" Skill Drain -- Exiled Force, Sangan, Cannon Soldier (if tributing himself) allow you to play Skill Drain and still get some monster effects. I haven't seen this card in competitive play for a good while -- I do know a couple people who have played it, but they never did very well with it. Maybe there will be some broken deck that T8's at a Shonen Jump Championship that uses it, then everyone will copy that? Who knows. Coin Flip Skill Drain is fairly huge. Just to give you a relative idea of exactly how much this changes the game, let's look at a few numbers. Generally, Monsters make of half a deck and noone runs normal monsters. So Skill Drain stops half a deck. Of the 1625 cards in the game, *630* are effect monsters. There. Done. By itself, it is effectively a Divine Wrath – chaining it to, say, a Call of the Haunted on Jinzo will certainly hurt your opponent, and it always helps to summon a Fusiler, let them summon out a Kycoo and then not only block the attack but also kill an opponent's monster and even out the LP. The problem is that you can't use it effectively without setting yourself up for something bad. In Cybernetic Revolution (the set after Lost Millennium) we get a 4 star monster with 2500 ATK that kills himself if Kozaky isn't on the field. He has some other drawbacks, but that is an excellent monster to play in a Skill Drain deck if you just look at it like that. 2500 is huge. Same thing with Goblin Attack Force (and Toon GAF), Giant Orc, and Fusilier Dragon the Dual Mode Beast, all of whom are capable of taking on guys like Vlord and Airknight Parshath immediately after being drawn. G Kozaky (aforementioned 2500 4 star) and Fusilier Dragon can actually kill Jinzo, assuming Skill Drain is out and has negated Jinzo and their effects. Stops a bunch of stuff flat in its tracks. So there you have it. Skill Drain is possibly the greatest anti-metagame deck right now, but it is also one of the more situational tourney-level decks. Generally, I don't rate cards outside of their own specific deck. This is not an exception. The card can't be plugged into a Chaos deck – it's counter productive to the theme of the deck. I just offer food for thought on the decktype. Hopefully I can actually get CotD's in. I couldn't finish Toon GAF or Toon Gemini Elf, so I decided to just get this one in on time. You CANNOT negate the effect of a monster that activates in the Graveyard with Skill Drain. Sinister Serpent, Mystic Tomato, Sangan and Vampire Lord are all unaffected (well, V-Lord won’t get his deck discard ability, but you know that’s not what I meant). You CANNOT negate costs with Skill Drain. That means if a monster, as a cost, sends itself to the Graveyard, Skill Drain can’t negate it at all. Exiled Force gets around Skill Drain (Yes! It’s true!). Cannon Soldier (if he launches himself) gets around Skill Drain. Skill Drain’s really a nice card, in the right deck. Sure, it’s a Continuous Trap, but there’s protection for those; and sure, there’s a 1000 LP cost to activate it, but that can be overlooked. A Skill Drain Deck will make use of cards like Goblin Attack Force and Giant Orc, taking advantage of their great stats for Level 4 monsters while negating their drawbacks (switching to DEF). It also works exceptionally well with Fusilier. You can summon Fusilier without tributing, and if Skill Drain is on the field, his ATK will be at 2800. Now THAT is rentsy. Skill Drain is also quite likely to impede your opponent’s deck a bit; negating the effects of some of his precious monsters is bound to slow him down. Of course, make sure that when you’re going up against Skill Drain, you know your rulings – a lot of people don’t, and as a result they get somewhat screwed over by people who claim Skill Drain does a lot more than it actually can. Our final card this week is Skill Drain, the bane of all Effect Monsters. At the cost of 1000 Life Points, Skill Drain negates the effects of all face-up monsters. Basically, Skill Drain negates the effects of ALL monsters, save a select few. Effects that activate in the Graveyard (such as Exiled Force, Sangan, Mystic Tomato), maintenance cost effect (such as Archfiends, Armor Exe), and effects that give monsters summoning restrictions (such BLS’s need for LIGHTs and DARKs, Dark Necorfear’s need for Fiends) are all unaffected by Skill Drain. It also doesn’t stop anyone from activating Ignition effects (like Cannon Soldier) but it will prevent the effect from doing anything. Now how can one possibly take advantage of all these negated effects? 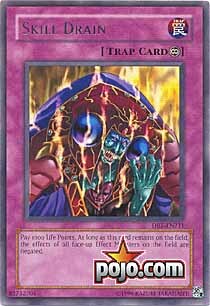 Why be making a Beatdown Deck that utilizes the strongest of the Level 4 or lower monsters that also have some king of negative effect. Toons can attack the turn they’re summoned, Giant Orc doesn’t switch to Defense Position after it attacks, Berserk Gorilla doesn’t die when in Defense Position and doesn’t need to attack every turn, Spirits don’t return to the hand during the turn they’re summoned, and Zombyra the Dark doesn’t lose 200 ATK points when it kills a monster and can attack the opponent directly. And wouldn’t you know it; all of these monster have 2000+ ATK! In addition to the cards you can abuse with Skill Drain, you also succeed is disrupting the opponent’s game plan. Without Effect Monsters the game reverts back to the days of LOB, where the only effects you could use were those of Spells and Traps. No longer must you fear Jinzo or face-down monsters, for they are meaningless. Instead, all you need to fear is S/T destruction, for that will bring your new world order of regular monsters crashing down. All in all, Skill Drain is a neat and powerful card that makes it own Deck very powerful. Advanced: 4/5. It affects both side of the field, so be sure the negation won’t harm you too much. Traditional: 3.5/5. There’s lot’s of S/T destruction, so protect your effect drainer. Art: 4/5. It’s Name That Monster Time! I see Dark Ruler Ha Des, and he’s losing his demonic powers! Pay 1000 lifepints. Negate the effect of all face-up effect monsters on the field. Quite an older card we have for Friday and I'm glad we do. This is one of my favorite trap cards. I keep two of these in my side-deck currently and they can actually be helpful. Just to name a few and I HOPE you got the point. The card IS powerful, but sadly isn't played all that often. 1000 lifepoints isn't a horrible price at all. Being able to negate the effects of practically EVERY monster is just WHOA. This card could also successfully shut down such decktypes say like Fire Princess? However, there are quite a few negatives about this card. A semi-successful deck could be built around this card running three of them. This card negates many a card, but equally as many cards own Skill Drain. The aforementioned cards all tear Skill Drain apart. Conclusion: A good card but won't be used by many. Those who realize it's good probably don't have deck space for it, including myself. Traditional: 3.85/5 Not quite worth a 4, but it stops CED here. every Phoenix, BLS, or Vampire Lord you run into. Art: 3.5/5 The cards this week seemed to have had cool art. Coin Flip Skill Drain is one of a few cards in the game that can seriously stop so many others. Let's take a look at what this card does. This stops 3 of 7, and the rest are restricted to one or 200 dollar cards (which is, effectively, restricting them to one per deck). On top of stopping 3 of the 7 big cards that hurt this one, it effectively makes useless more than half the monsters in the average deck. D.D. Assailant sees immense play. This card laughs at it and its Warrior Lady counterpart. Magician of Faith? Meet the friend to this card: Final Attack Orders. Cyber Jar? Morphing Jar? Jinzo? Airknight Parshath? Dark Magician of Chaos? Hah. Meet Fusilier Dragon, a no-tribute 2800 in this deck. Got a problem with Tribe? Chain this after they discard. Someone will be laughing! Don't like their Gravekeeper deck? Shut it down with unparalleled ease (well, assuming you don't use Royal Oppression instead). They attack your 1400 Fusilier or 1700 Zombyra with a Berserk Gorilla? Hey! Use Skill Drain in response to the attack and let them ram into a monster much stronger than theirs is! The monsters that it usually plays with the most – GAF (and Toon GAF, now), Giant Orc, Fusilier Dragon, and Zombyra the Dark – go horribly well with both Final Attack Orders and Deck Devastation Virus. Great combo potential, I should think. Control your opponent's hand. If they were just going to use Lightning Vortex or Smashing Ground on your only monster, just use DDV and hit them for a heck of a lot more than what they first took. Remembering that I only offer ideas on cards that only belong in their own deck, and not ratings, I wish you a happy weekend.